I stumbled across Umbrella Prints a few weeks ago while taking a lazy tour through a bunch of new-to-me sewing blogs. 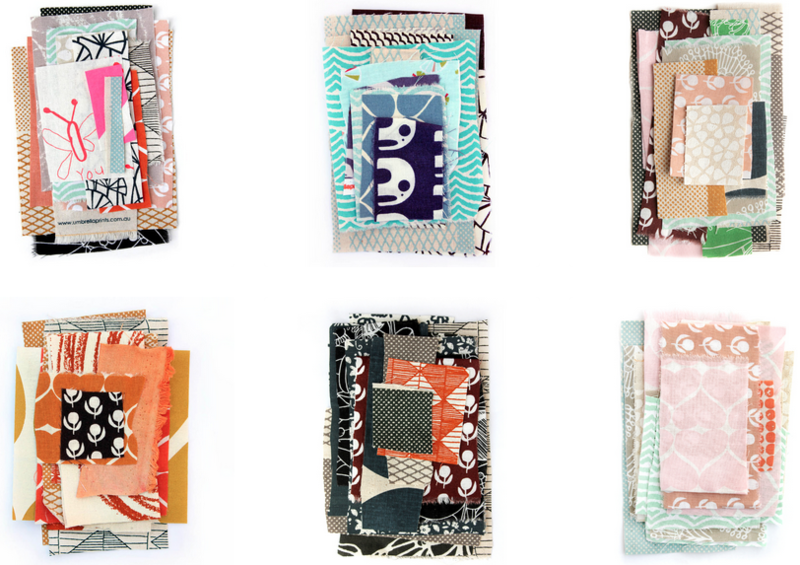 Turns out I discovered the Australian company, which makes beautiful organic printed fabrics, just in time for their 2014 trimmings competition, which challenges artists, seamsters, and crafters of all types to make something awesome out of a packet of leftover bits of fabric. The competition is in its fifth year, and previous winners have included this bright pink fish puppet, a jaunty mask and crown, a gorgeous art book, a matching set of sewing accessories and stationery, and an entire collection of whimsical collages. I ended up going with the “Earth” packet on the bottom left, a set of bright reds and yellows and oranges that I am so excited to work with. Now I just have to wait for it to ship from Australia….